“The climate change counter-movement has had a real political and ecological impact on the failure of the world to act on the issue of global warming … Like a play on Broadway, the counter-movement has stars in the spotlight – often prominent contrarian scientists or conservative politicians – but behind the stars is an organizational structure of directors, script writers and producers, in the form of conservative foundations. 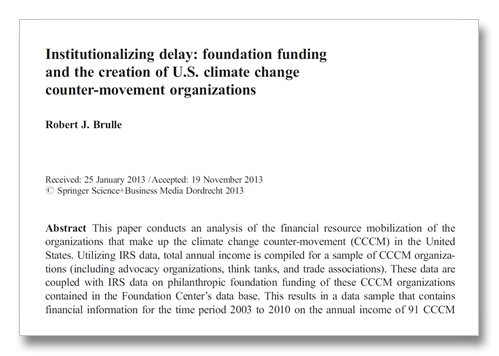 If you want to understand what’s driving this movement, you have to look at what’s going on behind the scenes.” The above is from Professor of Sociology and Environmental Science Robert Brulle at Drexler University and the press release for his research findings in the journal Climatic Change — Institutionalizing delay: foundation funding and the creation of U.S. climate change counter-movement organizations, December 21, 2013. This work looks at 118 CCCM organizations funded by 140 foundations that have been identified in the academic literature as participating in the climate change counter-movement. Brulle looked at IRS records from the National Center for Charitable Statistics and the Foundation Center. Records for 91 Conservative foundations and think tanks funded by 140 foundations were found. A total of 5,299 grants totaling $558 million were made between 2003 and 2010. This traceable funding however only amounts to an annual averaging $69 million per year. In order of funds revived, Brulle lists: American Enterprise Institute – 16%, Heritage Foundation – 14%, Hoover Institution on War, Revolution and Peace – 8%, Manhattan Institute for Policy – 6%, Cato Institute – 5%, Hudson Institute – 5.5%, Atlas Economic Research – 4%, Americans for Prosperity – 4%, Heartland Institute – 3%, Reason Institute – 3%, Media Research Center – 3%, Mercatus Center – 3%, National Center for Policy Analysis – 3%, Competitive Enterprise Institute – 3%, etc. A disturbing trend identified by Brulle is that the traditional largest donors, Exxon Mobile and the Koch Brothers, have seen their traceable donation dwindle to almost nothing after public campaigns by the Union of Concerned Scientists and Greenpeace to publicize their contributions to anti-climate science efforts. These donors are now using donor trusts to distribute their wealth. These financial contribution mechanisms allow them to participate anonymously and have their contributions funneled to the foundation or institution of their choice by the donor foundation. The means that these organizations use to confuse and defeat the discussion about climate with nearly a billion dollars a year are many. Working to elect Conservative lawmakers is their main focus but their efforts are much broader. They create propaganda in the form of media messages that tell us climate science is not certain and they contribute to scientific research attempting to discredit previous research showing the robustness of climate science. Much more insidious are the television, radio and print advertisements created for “the good” of the fossil fuel industrial complex. The families, babies and patriots shown in these commercials supporting the business as usual operation of our society, in situations dear to any breathing human, are all nested securely in a perfect world supported by fossil fuels. No doubt, our world is the fabulous place that it is because of fossil fuels and doing without them, in time frames that matter to climate change, is proving impossible. But treating the pollution from the burning of fossil fuels is not. Because of the long life of carbon dioxide this pollution has been building in our sky for centuries. The invisible threat in all the efforts to obfuscate, or to otherwise promote fossil fuels is the colorless and nearly indestructible gas carbon dioxide. Once, we did not know of the grave threat to humanity caused by this seemingly innocuous form of pollution that is a fundamental requirement for life on this planet. But that time has passed. We now know without doubt that a small increase in atmospheric CO2 changes the delicate climate balance of our planetary ecosystems radically. Moving our society to a cleaner form of energy will certainly happen organically as economics dictate. But moving our society to mitigate for literally centuries of pollution while this energy generation switch occurs is another matter. The CCCM has even poisoned their own well. The latest research is pointing ever more towards simple removal of carbon dioxide from our atmosphere as an economically viable solution to climate pollution. Because of the great authority of this $7 billion umbrella however, scientific knowledge revealing the facts around what is becoming known as “air capture” has been defeated through obfuscation even in environmental advocacy circles. The CCCM has completely destroyed the ability of climate science to have a functional outreach component. The National Academy of Engineering, which is a part of the National Academies of Science, in their annual 2012 symposium report tells us that this $7 billion umbrella is about the same as the total federal research into Carbon Capture and Sequestration (CCS) from coal generating power plants. The main reasons why air capture isn’t implemented already is that only $300,000 in federal research has been done on air capture. Jones, Removing Carbon Dioxide from the Atmosphere: Possibilities and Challenges of Air Capture, page 13, Frontiers of Engineering, National Academy of Engineering Symposium 2012, National Academy of Sciences. page 16, fourth paragraph.